Venture deep into the Amazon rainforest and you’ll find the Brazil nut trees, jungle skyscrapers can reach heights of 200ft and live for more than 500 years. As demand for the nuts has risen, so too has the positive impact on the communities and families that harvest the nuts across Bolivia, Peru, and of course, Brazil. Demand also incentivizes governments to preserve the rainforests where this key revenue-generating crop is grown. Thousands of families rely on harvesting Brazil nuts for survival- a back-breaking job which requires navigating the rainforests, scaling trees, transporting the nut-holding pods, and hacking them open with machetes. Red River and our customers depend on these families for Brazil nuts. We are one of the nation’s largest Brazil nut importers, giving us a vested interest in helping communities and South American governments preserve the Amazon rainforests. 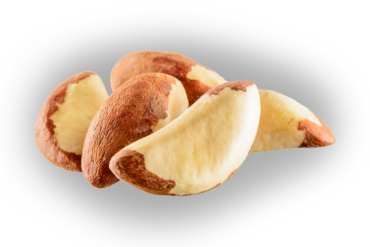 Brazil nuts are commonly enjoyed as a standalone snack or as part of trail mixes. They are also used by bakers in confectionary items (such as fruitcake), sweetened and crushed for dessert toppings, made into puddings, dips, and even used as a topper for cheese, Brazil nuts are packed with minerals, antioxidants, essential fats, proteins, fiber, and carbohydrates; just two nuts provide you with 160 percent of the recommended dietary intake of selenium, which aids maintaining a healthy metabolism and may decrease the risk for prostate, colon, gastrointestinal, lung and breast cancers.